Congratulations to Lizzy Yarnold! Again! Not only has Lizzy won a gold medal in the winter Olympics, a rare enough feat in its own right, she has done so in 2 consecutive Winter Olympic championships. A feat never before achieved by a British Athlete. What has Lizzy’s success got to do with mental health? One of the factors highlighted in 2014 in the Guardian was how, in her preparation for the event, she would picture herself doing every twist and turn of the track, over and over. Visualisation is not just a process where you see yourself doing something, it also involves a bodily rehearsal of the actions you would make if you were actually doing it. Electrical changes take place in the muscles we would use in the event in the same sequence as the action would require. Visualisation is intricately associated with movement and all movements are visualised and rehearsed before we make them. I was interested in how Lizzy used it, as visualisation is an important feature of our Positive Mental Training (PosMT) programme, which in itself came about as a co-incidental offshoot of a Swedish Olympic sports psychology programme. I spoke to Lizzy about this in 2014, wondering if she had been taught to do this by a coach to improve her performance. It turned out that she had adopted the technique spontaneously without instruction; starting as a pole vaulter when training, she developed a technique of visualisation in order to describe each jump to her coach, visualising how, when and where she had placed the pole and how she moved her body as she rose up. Chris Hoy, who also has a huge tally of Olympic Gold medals over many years, has also described how he does not sleep the night before a race. Instead he spends the night visualising the upcoming race, every twist and every turn of the course. Then he gets up and sits on the saddle and the rest is automatic, his body runs through the movements with minimal interference, just the occasional correction. There are 2 learning points here, one is about role of visualisation in preparing for an event and the other is about sleep. Sometimes when you can’t sleep it is because you are doing important mental preparation and any anxiety (which may seem intense in the night) will fall away when you are faced with the task. The key is that your mind is looking after you. We need a good sleep, we get considerably less now compared to the 80’s and the mental training programme is very effective for sleep. Many Doctors and NHS staff (often on night shifts) use PosMT for their own benefit to restore a healthy sleeping pattern, myself included. The physiological exercises are very good for removing the barrier to sleep, try listening in the middle of the night when you wake up. In both these cases, the athletes have been constantly practicing the event mentally and seeing their ideal performance state. Naturally of course they also need a high level of fitness, mental rehearsal would not help an athlete inexperienced in moving their bodies in their sport. However, to succeed, you need both the physical ability and the mental visualisation. Some coaches have been aware of this for a while; the coaches for the Canadian swimming team, if their swimmers had a bad heat would make them watch the race. They would relive their ‘bad’ performance, and then remember their last good performance absorbing themselves in a visualisation of the successful race instead. One coach who understood this was a Swedish academic and a sportsman, Lars Eric Unestahl. He recognised the importance of positive visualisation and asked Olympic gold medal winners to describe what they thought about during training and race preparation. Many of them described recalling memories from the past, one famous hurdler who also won gold over 2 consecutive Olympics described how he would recall positive childhood memories, one of winning the egg and spoon race in preschool and one of playing games in the woods outside Stockholm as a child. Lars Eric decided to make a programme that would incorporate this memory recall in an athletes practice. Along with bodily techniques he turned this into a method of coaching using audio recordings to allow the athlete to develop a deep state of introspection, now described as introception, which is the ability to sense the state of the body and deepen the beneficial parasympathetic state of relaxation. Lars Eric also noticed that the athletes using the programme would describe a greater sense of life satisfaction and happiness. At work colleagues would say ‘What is up with you? Are you taking drugs? You are coming to work all cheerful and optimistic and being really friendly.’ I thus thought, working as a young GP in Scotland, to use it with the many depressed patients I had. It was well recognised that Scotland had one of the highest suicide rates in the world for young men, so Lars Eric’s observation struck a chord. I spent some time with him talking and watching, then I took the programme and tried it out with my depressed patients. The effects were powerful and sometimes transformational as people became outgoing and positive about their lives. Since then I have come to recognise the link between what the athletes were doing and what my depressed patients were doing. The athletes were able to visualise and develop their ideal performance state, while the depressed patients are able to visualise and practice their ideal state also, that of their recovered selves free from depression. They learn to visualise, and hence rehearse, how they will behave in social company, and then like Chris and Lizzy, it became automatic when in context. Depression is a state of withdrawal from society, depressed patients do not engage socially with others be this, friends, family or colleagues. To counteract this, you can use an altered state of attention, such as that engaged with during PosMT, to change their model of the past. Simply telling them to stop being so negative invokes powerful factors that make them reject this idea. Visualisation and these covert movements also combine to create a skill we use whenever we watch someone else perform, be that social or athletic. We are rehearsing their movements with our own bodies unconsciously, trying out the significance and intent of their movements. We are creating a mirror of their minds in our own minds, the same brain cells that make the movements in our bodies respond to their movements and we remember this and can access their patterns of movement. We can then access this state. There is one more essential factor in Olympian success. Olympic athletes need to have access to a very powerful sense of competence, a feeling that they can perform in the situation at hand. Lizzy’s emphatic smile attests to the notion that she has a very positive and supportive emotional state behind her. What good are positive emotions? They make our brains work more effectively, particularly under stress. With a foundation of positive emotions we can think clearly, we are more mentally nimble and able to deal with situations. We become more creative if we can picture ourselves coping and all of this means we will bounce back more quickly after a stressful situation. This is a quality called resilience and Olympic athletes have it in spades, they have to or else they wouldn’t be in the Olympics, at the first failure they might drop out. They need to understand that sport is not about innate ability, it is about learning from ‘failure’ they need to adopt a growth model. Where do these emotions come from? They come from our memories, we have shown this in our recent research with McGill University (Philippe et al 2017[i]). What aspect of our memories make us positive? McGill found it was the levels of autonomy, competence and relatedness contained with each memory. A stressful situation recalls a network of associated memories linked by common themes that lurk unconscious and hidden under the surface of our minds. Along with McGill we teased these memories out and categorised them, the first 3 that come to mind are key and will inform our ability to cope, developing our competence in any stressful situation (Philippe & Dobbin et al 2017). If 2/3 of the memories are needs fulfilling, demonstrating a similar experience where we exhibited autonomy, competence and relatedness we will cope with the situation and experience growth, protected from depression and anxiety by a positive sense of control. If 2/3 of the memories are thwarting of our needs, that is, generally feeling a loss of control and incompetence, then we will struggle to cope. These feelings will inform our visualisation and we will falter and stumble. The good news is that we can change the memories that underpin our coping and increase the count of coping memories by 1. I do not have the space to go into how, but we have shown that it is a skill that can be developed with simple practice, by using the skills that Olympic athletes use, despite being unaware of them. This means we can learn autonomy and competence becoming stronger under stress and deal with it more effectively. Which brings me back to Lizzy. This time in 2018 Lizzy had a fellow athlete in her own sport. She naturally would watch this younger girl, her mind and body constantly assessing the ability of the younger girl, seeing her strengths and weaknesses. She found herself visualising the end of the race and ‘saw’ them both on the winner’s podium. I believe that Olympic champions like Lizzy will have a 3/3 positive network of memories. And what are these memories? I think there is a clue in what Lizzy sees for her future. She started talking about learning to knit as a child with her Grandmother, who died between the 2 Olympics, clearly a most supportive relationship. I don’t know, but I would hazard a guess, and I hope Lizzy doesn’t take this as too presumptuous, that perhaps her Grandmother was a person who made her believe in her autonomy and competence, supported by a loving relatedness. Perhaps the desire to learn knitting will be expressed in a new sport, she has after all already swapped between sailing, high jump and this new sport of skeleton. She also talks of a desire to nurture self-belief in children inspired by her work in schools, to inspire, perhaps a model from her Granny. Autonomy, competence and relatedness underpin the development of self-determination, which inform our sense of purpose and meaning, and have been shown to represent the basic psychological needs which allow us to access well-being across all cultures and nationalities ‘Societal need fulfilment predicted SWB, particularly for life evaluation, beyond individuals’ fulfilment of their own needs, indicating the desirability of living in a flourishing society’. (Tay & Diener 2011[ii]) We are very pleased that together with our Canadian colleagues we have shown that these needs are derived from the self-determination held in our memory networks which can be changed by adopting a growth model. My thoughts are that excellence in sport is a form of communication between athlete and observer, literally a form of body language that we all understand, a language of flourishing and recognising the beauty of the human form but above all the beauty and potential of the striving human spirit an expression of our need to communicate and relate, a true and inspiring mind body connection. [i] Philippe F, Dobbin AE, Ross S, Houle I. (2017) Resilience facilitates positive emotionality and integration of negative memories in need satisfying memory networks: an experimental study. J Pos Psychol 2017; DOI: 10.1080/17439760.2017.1365158. World Sleep Day – And I’m awake! International Sleep Day – and I’m awake! I have a confession to make, I woke up at 3.00am this morning and couldn’t get back to sleep; on world sleep day of all days. So I got up and did some writing, something about an issue I was thinking of writing up (not this blog! ), I think I must have been visualising myself doing it, and just did it. When I can’t sleep I usually use the breathing exercise from Positive Mental Training, often it will send me straight back to sleep, focussing on the body and the internal sensations of breathing is one of the most powerful ways of getting the body to calm the mind, this has been known in many mindful philosophies for probably over 3000 years, originating in the Indus valley. Today we can recognise the pathways whereby breathing changes the function of the body/brain, and some do, although conventional psychology has little interest in the body, which is a sad loss to all those who have to go through the conventional ‘talking therapies’. Partly it works through the effect of increasing the concentration of carbon dioxide, which increases the flow of oxygen and nutrients to the body which then feeds positive ‘oxygenated’ and ‘nutured’sensations back to the emotional brain. The book ‘How do you feel? An interoceptive moment with my neurobiological self ‘ outlines the way sensations become emotions, and the author, Bud Craig, an amazing neurobiologist and a friend has spent a lifetime working out the pathways, and we regularly discuss the mind/body body/mind links . We cannot exercise our will to fall asleep, the voluntary system does not do it, we need to use a different system of control, the breathing exercise in the programme puts you in an alternative state of consciousness which means that you will fall asleep if you need to. Many of us, as we get older do not sleep in such a regular pattern, there are many reasons for this, too many to go into, but it is quite natural for the pattern to change. The thing to do is to accept it. But we all have excessive anxiety about not sleeping; ‘How will I cope with all I have to do tomorrow?’ then we picture the anxiety provoking situation, perhaps meeting a difficult client, a family obligation, a discussion with our boss, a presentation to a group, a social event. So ‘I must get to sleep’, which makes it even less likely we will, a vicious cycle. I once got a lift in a Taxi as I went to an important conference (RCGP) where I had to make a presentation to a group of colleagues (over 100 as it turned out) some of whom I knew would be dismissive or hostile . Could I sleep? No way! After 2 hours I was awake. I listened to the mental training for a while did a lot of breathing, felt really quite empowered then got up and prepared for the journey. I phoned for a taxi and off we went. As one does I got chatting to the taxi driver (taxi drivers are great listeners) and told him I couldn’t sleep. He told me about Chris Hoy, Britain’s greatest Gold Olympian. The night before a race Chris Hoy doesn’t sleep, he runs the course over and over in his head with his eyes closed in a relaxed state he takes his body through every bend rehearsing how he will feel, then in the morning gets up, goes to the race and as soon as he sits on the bike the performance he has imagine is triggered and his body takes over, and he wins the medal. Imagining a performance is a powerful way of preparing for it. But lots of situations are performances, in many ways all social interactions are performances as much as an athletic performance. Athletic performances are a kind of social performance, self expression through the body, we all admire the Olympians perhaps recognising their performance, it is like a universal language. However we can’t all be Gold Medal Olympians. But for some years Positive Mental Training has been in use at the local psychiatric hospital, often for patients in acute distress, but also by the staff. This is particularly for nursing staff who are often changing shifts, they can use it for a couple of days and it rebalances their sleep pattern. The advantage of using a programme which has its origins in Olympic Sport is that there is no stigma involved; let’s all put in an Olympic sleep performance. So if you can’t sleep (lets assume you have followed all the sensible advice – no tea/coffee or cigarettes late at night, maybe had a bath, read a book, not left your computer or phone on in your bedroom) listen to the first track of the mental training the breathing (free on the app here) it will adjust your body and help you relax. If after that you can’t sleep just lie in bed and enjoy the fact that you are warm and comfortable, and that your mind is preparing you for the day ahead. There are times you need to sleep, and times you don’t. Trust your mind/body to do the right thing. 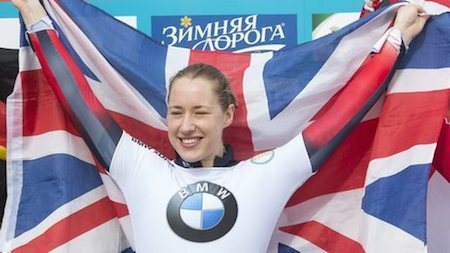 I spoke to Lizzy Yarnold a few days ago. She is a remarkable person and an accomplished all round athlete, who won the only British Gold medal at the Sochi Olympics in 2014. I was very interested in how she won her gold medal, and I wrote a blog about this at the time of the Sochi Olympics, based around an article that appeared in the Guardian describing how she used visualisation to help her during training. I wanted to explore this further, given our own use of visualisation in promoting recovery from mental health problems, such as anxiety and depression. I told her how I had come to develop an audio mental health programme, based on a Swedish sports training system, as a way of promoting recovery for patients with stress and depression in my own NHS GP practice, and how this has become popular with many GPs, psychiatrists and mental health staff in Edinburgh, for their own use as well as for their patients. This programme develops a positive mindset, a particularly deeply relaxed mental state, and adds directed visualisation, and our research has shown that patients can look back at personal life events and see them from a different viewpoint, changing a painful negative experience into a positive one. I have been working recently with some of the brightest neuroscientists in the field, and I understand how this comes about, how the same mental processes can at the same time be such a useful tool for sports performance, but also such a powerful force for recovery from depression. The science behind this will be the subject of my forthcoming book. So I was particularly interested in the way Lizzy told me that she had used visualisation within her own training. She developed this herself from simply talking to her coach. This started when training for the Pole vault at the age of 14. ‘In the Pole Vault it is very difficult for a coach to see all the technical details of the jump, for instance how and where you plant the pole, so I found that by picturing the situation from an external perspective I could report clearly to the coach what had happened. I found that I could move in and out of the visualisation, and the more I did this the easier it became, and I found that this was of great benefit to my training.’ Later she found that she could use the same technique for helping her deal with future events, ‘ If I have a big event coming up where I will be under a lot of pressure, like the Olympics, I find it very useful to picture the situation in advance, and I then find that I can just relax on the day and the event generally goes very well.’ Lizzy also found that after a while she became more relaxed while doing the visualisation, and she recognised that relaxation increased the benefits of the visualisation. She developed different positive anchors to ground herself when going into an unknown situation. In non scientific terms it is as simple as this. We all need the ability to bounce back from our difficult past events, whether we are Olympic athletes performing at the top of our game, or just those living on a troubled estate, perhaps with multiple stressors, such as partners using drugs/ being aggressive or violent, while at the same time having to deal with a past history of neglect or perhaps even abuse, all of which are associated with depression. The same techniques can improve performance to give us the edge to win through and give us the positive emotions to see that we can have a good life, that despite all the bad things that have happened we can control how we feel and feel good about ourselves again. Lizzy is very much a polymath in sport, and has participated in many different sports throughout her life, and I believe that her mental training techniques have probably helped her considerably. There is a tendency we all have to carry beliefs based on some received wisdom, and for athletes this may well encompass the belief that we should focus our energies in one field, as this will allows us to concentrate on the minutiae of technique. However Lizzy has demonstrated that one of the most powerful techniques is that of mental training, a transferable skill between sports, and between sport and life. World Mental Health Day – Let’s Celebrate Human Values. The global burden of diseases 2010 study has identified depression as the second most common cause of disability worldwide, Nick Clegg said on Wednesday that three-quarters of patients needing “talking therapies” for conditions such as depression will be guaranteed treatment in as little as six weeks, with 95% starting treatment after a maximum wait of 18 weeks. While this is a great soundbite there are major problems with this approach. There are 4 million people in the UK with depression and despite good intentions the Increasing Access to Psychological Therapies (IAPT) programme started in 2006 is not treating anything like the numbers of people it was planned to (800,000 in 2006), in 2012/13 out of 760,000 referrals only 127,000 depressed people attended for therapy. . So the referral model is not working for depression, it’s just not reaching the people it needs to. Vikram Patel of the Kings Fund, looking at the European figures on depression in 2010 recommended that treatment should be devolved to the front line. And yet this idea of referral is clung to as the best chance to help those with depression. We need to look at it in another way, and we need to learn the lesson from studies of depression. As I outlined in my recent editorial in BJGP one of the most comprehensive studies in depression, the Treatment of Depression Collaborative Research Programme (TDCRP) in 1985 identified that the therapeutic relationship with the therapist and the expectation of recovery were by far the most important predictors of recovery, the type of therapy (CBT, interpersonal therapy, antidepressants) contributed virtually nothing to the recovery, placebo was as effective as the therapies. The blindingly obvious conclusion from this was that more should be invested in researching and facilitating the interpersonal relationship factor, and other ways of increasing expectancy. But the outcome of the study was ‘Business as Usual’ nobody wanted to hear the message and the study was quietly ignored. Can we increase the use of interpersonal factors and put it in the front line? Certainly we can, there is a group of therapists, who work in the front line, who see and deal with 90% of depressed patients on their own and who are on most surveys the most trusted profession in Society, General Practitioners. Most patients prefer a psychological therapy to antidepressants, when we did a study offering a GP guided self help psychological treatment or antidepressants 86% of patients chose the psychological therapy. GPs were not recognised in the LSE report that started the IAPT programme as anything other than a referral agency. But there are ways of helping GPs to enable recovery , as a good starting point they need to understand the implications of the research of studies like the TDCRP study, and understand the nature of distress and recovery, and offer programmes that they themselves supervise so that they can authentically model to patients how they will recover. Just to say to a depressed person ‘I have seen and helped many people like you and I know you can recover and I will help you’ you can get better’ can be the start of a process of recovery. GPs need to be supported and valued for the work they do and recognised for their contribution to recovery, this whole area needs to be looked at and researched from a human values standpoint. In our experience GPs who are supported and encouraged by such an approach report added benefit for themselves and their patients. The cost savings of using the front line in this way could be enormous, not to mention helping the 2/3 of those who, it is recognised, receive no treatment at all. We should celebrate the fact that a trusting warm relationship and optimism are what really count and invest more in the relationships that already encompass such values. 1985 was a long time ago, but its not too late, indeed its never too late to start accepting this message. Congratulations to Lizzie Arnold Yarnold on her Gold medal success, but also thanks to Elise Christie for her resilience. Look on the report about Lizzie Yarnold and watch the interview with Elise Christie (see below in text). Their experiences validate the line above from Paul Simon (‘There Goes Rhymin’ Simon’). On the path to Gold Medal Success athletes will enjoy many successes, but also many ‘failures’. What distinguishes the successful Olympic Athlete is how they deal with failure, rather than taking it as a sign of a personal failing and looking for some character flaw, blaming themselves, they are able to step back and see the situation differently, to ‘learn how to fall’. Resilience and mental toughness are key attributes in winning Olympic Gold. No-one is tougher or more resilient than Olympic athletes, they are the world’s elite at ‘bouncing forwards’ (gaining strength rather than bouncing back to the same point), and the toughest of all are the gold medal winners, When I was studying mental training in Sweden, Lars Eric Unestahl, who founded the concept of Integrated mental training (from interviewing gold medal winners) found that athletes who used the programme not only performed better but became more relaxed and productive at work and at home, this led me to think the techniques might work well in depressed folk. Certainly Lizzie gets a very good press for having a sunny disposition. See our interview with Lars Eric on our video page (top right video) he describes a number of athletes using the same techniques as Lizzie through the same mental training we use for increasing mental wellbeing. The other good example of mental toughness is Elise Christie, the skater who missed out qualifying in her heat, skating just outside the finish line. Watch the video of the interview she gives on the page where they show the race she was disqualified from after qualifying (the interview is down the page a bit ‘Elise Christie ‘gobsmacked”). The interviewer was trying to provoke her into a negative reaction (always good TV) to get her to be upset, but she dealt well with the situation and significantly did not blame others for what happened or lash out at the judges. She is, like most Olympic athletes, able to reappraise and see the lost heat as a learning situation, accessing positive emotions from a potentially crushing situation (or a timely lesson – again it depends how you see it) and gaining strength, once again bouncing forwards. Particularly interesting to observe is when, at 2 moments of intense stress, she smiles (1 minute 44 and 2 minutes 15) a genuine smile, some positive emotion or memory or image is coming out of her unconscious and over-ruling the negative stress, allowing her to see things from a new perspective. This is a key skill in toughness training seeing things with clarity without judgment and without self criticism, but also a key skill in mindfulness training. It is more important to be able to encounter a setback and gain the positives from it, in a way this is more important than winning, because in the long grind to become one of the Olympic elite you will lose more than you will win before you get it right. We have previously noted the close similarity between mindfulness training and mental training and hypnosis and autogenic training, all are a similar mix of physical relaxation and mental preparation, but only mental training has so much specific visualization. This allows people to rehearse for events in the future (e.g. sporting events) in order to be able to maximize the benefits of the positive emotions to learn from the visualization and carry the learnings into their future performance (positive emotions allow the brain to gain the maximum benefit from a rewarding situation) and perform at their best. The positive spin off, as Lars Eric says in his interview, is that they saw co-incidentally in the athletes an improvement in mood, (which those who use Positive Mental Training see often in their distressed patients/clients), as he says, others perceived this change more than the athletes themselves, a sure sign of permanent change. The ability to see the positives in a negative situation to turn negative into positive emotion, and apply the learning unconsciously applies to life as much as to elite sport, we all need to be able to bounce forwards, particularly in challenging times. It is not just elite athletes who gain from these skills. Someone struggling to bring up a young family in poor housing, perhaps a single mum whose children encounter difficulties at school, needs to be able to access positive emotions to help them see the opportunities and benefits in every situation, they need these skills as much if not more than the athlete, and or an overworked nurse or doctor needs to be able to see the deaths they constantly encounter as an opportunity for learning and personal growth, rather than an opportunity to reflect on their failings. Finally to say, mindfulness is the buzz word at the moment, it is seen as a panacea that will sort out all our problems. The challenge is to understand the benefits of the processes that come with mindfulness, and incorporate these into our continuing quest to understand the indomitable and adaptable human spirit, where hope always springs eternal, to learn what it can tell us about the human spirit. Mindfulness, autogenic training, acceptance and commitment therapy, cognitive behavioural therapy, they all have something to tell us, but we have to constantly seek out what we can learn from them, incorporate these learnings into the whole picture, and move on. See a new piece by myself on compassion –transcript of a talk last year – in the Journal of Holistic Healthcare new winter edition which includes the latest neuroscience research on positive emotions, including how the process of oppositional inhibition (positive overcoming negative emotions) works click here and its page 16. Today the 10th of October is World Mental Health Day with a focus on older adults. One of the first things that attracted me to the idea of positive mental training, sowed a seed you might say, was an experiment from the 90’s by Becca Levy, a very original thinker and psychology researcher from Yale. She recruited older people from her area to fill out a survey. When they arrived at the facility they had sensors fitted to their hands and feet and were asked to walk down the corridor to the room with the computer based questionnaire. They then filled out the questionnaire and walked back down the corridor. On both walking occasions they were filmed. They were divided into 2 groups, and words were flashed subliminally on the screen, so fast that the person did not consciously see them, but they were registered by the preconscious brain. One group got the words “Frail….vulnerable…forgetful” while the other group got “wise… mature…. experienced”. When comparing the films of the walking before and after the questionnaire, it was noted that those who had the positive words flashed up would swing their arms more and take longer strides than they had before, those who had the negative words walked in a more frail way, living the stereotype of ageing. 2 points were driven home to me very succinctly; one was the link between the mind and the body. The message had bypassed the conscious mind and gone straight to the balance and visualisation areas. I was already aware of this in my clinical experience as a hypnotist. In another study it was found that people who expressed a positive view of ageing taking all other factors into account such as health, genetics, smoking, drinking, occupation, social class, lived on average 7.6 years longer than those who did not. The effect of subliminal negative stereotypes which our media constantly gives to older people saps their self esteem and damages their health, they are denied the ability to experience the positive emotions that ageing can bring. She did a study of 18 year olds in America and in China. The American youth when asked what they would be doing when they were 80 thought they would be ill, in a wheelchair, unhappy, dependent, the Chinese people saw only the positives, they would be admired by the young for their wisdom, and be able to escape the censure or disapproval of the young, they could have a good time, laugh, let their hair down, behave disgracefully and enjoy themselves. The thing that occurred to me here was that there was an opportunity by distracting attention to assist people who were sad and unhappy or anxious about life to change their outlook to a more positive outlook and that is what I have pursued. So I salute Becca Levy, and all the researchers in this field of stereotyping who have helped me find a new way to change the outlook of these people. We have a programme called ‘Mental Training for Positive Ageing’ which can counteract some of the negative media messages and uses Becca Levys ideas and our own. I have seen some remarkable changes in older people using this. Let’s all look forward to wisdom, experience and maturity, so we can celebrate the joys of being older, and create a new and robust view of old age. 3 sides of the same coin: Burnout, compassion and resilience. There has been a lot of attention given to the issues of burnout in GPs and on compassion in the past few weeks, this latter being part of the ongoing fallout from the mid staffordshire enquiry and the subsequent Francis report. There are increasing strains on young GPs newly going into practice, and there have been in recent years quite a few papers on the subject of burnout. There was an article on resilience in the BMJ a couple of weeks ago, and I wrote a reply to it, as I felt that they had somewhat missed the point. They looked at the factors that were correlated with resilience, self directedness, co-operativeness, harm avoidance, and persistence, saying that we should consider and discuss and reflect on these characteristics. However they confused the factor of correlation with mediation, just because these positive characteristics are found in resilient folk does not mean that this is what makes them resilient. In fact all the evidence points to the same factor underpinning these characteristics as underpin resilience. More of this later. But certainly there is a danger that sitting round contemplating and discussing and reflecting on these characteristics will make us feel worse, leading to a cycle of rumination on our own and the health services deficiencies. One of the most shocking revelations on burnout was a study last year when a large cohort of GPs in Essex showed that 46% of practicing GPs were burnt out, although their patients did not notice it, only their professionalism kept them going. This echoes the findings we have had from looking at GPs attending our workshops. The authors of the Essex study felt that much of the problem comes down to a question of optimism, or lack of it. This I felt was a very perceptive observation, and echoes much of the research on resilience. So burnout is defined by 3 factors, emotional exhaustion, cynicism (also called depersonalisation) and personal effectiveness (this latter scored in reverse of course). In a study of nurses and their patients which looked at what burnout factor most impacted on the patients perception of the level of caring of their nurses, depersonalisation was the factor that had the greatest impact, defined as an ‘unfeeling or impersonal response toward recipients of one’s service, care, treatment, or instruction’, and I cannot think of a better definition of lack of compassion, indeed it is almost defined by lack of compassion. So burnout leads to lack of compassion. Burnout is recognised as a high risk in those dealing with the public, and its not really surprising that constant exposure to distress and suffering takes its toll on those in the caring professions. Doctors who show compassion to their patients then have difficulty relating to the demands of their personal relationships. Resilience is defined as the ability to recover quickly from a distressing situation, and is crucially important to avoid burnout. A resilient doctor will find it easier to let go of the distressing situations they have encountered during the day when they get home, and can react appropriately to their friends and family, and they are less likely to blame themselves when their treatments are ineffective in helping their patients. They will not require constant praise from their patients to support themselves emotionally, which is recognised as one of the key negative spirals in burnout, and they will be able to find internal resources to keep their spirits up. There has been a considerable amount of research into resilience in the past 30 years, one of the most perceptive researchers is Barbara Fredrickson, a professor in Stanford University has led the field. She showed that the key to resilience is access to positive emotions, and our own researches have supported these findings, and have shown us the factors that support recovery. After the events of 9/11 some people seemed to bounce back and flourished, while others became depressed and withdrawn, and she showed that the factor that mediated (i.e. was the cause of) the ability to bounce back was access to positive emotions. She pursued this idea and came up with the broaden and build theory, that there is a critical ratio of positive emotions to negative emotions (about 3:1) that leads to more effective brainpower, and more outgoing and sociable behaviour, leading to more positive emotions, an upward spiral of positivity, which will rapidly extinguish the effects of negative emotion, withdrawal etc. Positive emotions change the way our brains function we become better at solving problems, we have more cognitive flexibilty, This is because as well as being able to fight and run away, survival is a matter of being able to take advantage of an opportunity quickly even in the midst of a crisis it is the person who can bounce back more quickly who will win the day. But also the cognitive flexibility means we can see others viewpoints more easily, we negotiate better, we are more empathic to others and ourselves. Positive emotions make us compassionate. So lets look at our doctor going home in the evening after dealing with a demanding evening surgery. If he has a poor ratio of positive to negative emotions, under 3:1 then he will withdraw from his wife, friends and family and probably go to bed early. If he is above the critical ratio he will interact successfully with these people and will get positive feedback and get more positive emotions. But work in the NHS is very demanding, particularly as a GP and to have enough positive emotions at the end of the day is a challenge, and a successful relationship demands an even higher level of positive to negative, 5:1. So how do you increase your level of positive emotions? This is the 64 thousand dollar question, the philosophers stone of depression research. Because there is a tendency for people with depressive thinking (which any of ourselves under stress might find ourselves in), when thinking about positive events or are in a situation that might normally make them feel positive emotions, to paradoxically feel worse. Exactly why we don’t know, it is a phenomenon called the upward counterfactual effect, in as far as we can ask people they say its a matter of thinking ‘look how happy I was then compared to how I am now, how much worse can I get?’ But there is a particular form of thinking that can cancel this effect, a form of mindful thinking, or at least a cross between mindfulness and distraction. We have researched into this and found the right combination of thoughts and processing style, more on this when our research is published. I think this accounts for the powerful effect that Positive Mental Training has on severe depression, because it is specifically targeting the depressive vulnerability. Positive mental training was originally created for olympic athletes. I have particularly found it is very useful in doctors and health service personnel. I have also seen amazing changes in stressed single parents living on run down council estates, these people may need even higher levels of positive emotions to deal with multiple family and financial deprivation problems. I am sure that teaching staff need the same, and social workers and social care staff. Sheila and I are constantly amazed at the different folk who seem to derive huge benefit from it. Because I do believe that if you have been below the ratio and can increase your level of positive emotions it is a truly transformational experience. I have found it so myself, and if you come to our workshops you will see many people who have experienced such a transformation from using positive mental training. And if it transforms patients it will transform their doctors. They will sometimes witness the change in others who seemed to be mired in negative personality ‘traits’, who will change, and become almost unrecognisable. This is what we all wanted when we went into medicine, we will occasionally see it in our patients with physical conditions, when they get the right treatment the correct drug or operation, but 60% of GP consultations have a psychological element, we need it for all of them. Doctors find that changing others in a positive non drug way with positive emotions boosts their own self esteem and lifts their sense of personal effectiveness, and this alone may take them above the critical ratio, and if they are particularly bad they can use the programme themselves, a large percentage of doctors who come to our workshops do. Because we all need expectation of improvement, if doctors understand and recognise the things that help them to recover from stress, they will communicate that to their patients, who will mirror their optimism, understand implicitly that they know what you are talking about. In the most comprehensive study of depression treatments it was found that the type of treatment you have, psychological drug or placebo is almost irrelevant, the thing that predicts recovery is whether you can see yourself getting better, your expectation of recovery. This is why I think the doctors who wrote up the Essex study were spot on with their summary that burnout is about optimism, and if we can increase optimisim we will help ourselves. I do not mean to say that personal training is the only key to turning around the lack of compassion in the health service. Other factors that research has identified as crucial in compassion that nurses show to their patients are adequate staffing levels and good communication and support and self respect between all clinical staff. Science however shows that there are things we can do for ourselves and we should respect that and not rely on virtuous homilies dressed up as ‘factoids’ because they appear to be common sense. We ask for evidence before treating our patients, we should equally demand scientific evidence when helping our selves and our colleagues. These are challenging and interesting times. May you flourish and give and receive compassion.